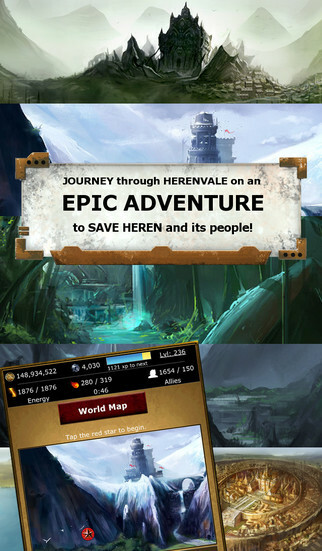 Chronicles of Herenvale is a new fantasy adventure MMO similar to Kingdoms Live and Castle Age, but with more sophisticated role playing elements. Heroes have stats which do affect their abilities to quest, battle and raid. The web version also has guilds and chat. The game also has a large potential player base, as it’s on iOS, the web, and Android. According to the developer, players start out questing then typically progress to PvP battles and choose whether they want to focus on a more PvP or PvE build. The cooperative raids allow lower level players to benefit from the power of their more experienced brethren as well as use their charisma to build out their army by inviting friends or just recruiting in-game. The game includes a crafting system that gives free players the chance to earn top tier gear. IAP allows the player to advance faster, buy gear and build a more powerful army.